Being a beginner in yoga, I was a little intimidated by the Iyengar Yoga workshop, held at the Ojasyoga centre on 21 June 2009. This was my first experience of Iyengar yoga and learning from an experienced instructor such as Riana, who had trained under B.K.S Iyengar himself. I was afraid I’d be asked to fold myself into a pretzel, and that I would embarrassingly be the reason for a medical emergency holding up the class. Fortunately, that was not at all what was in store for me. I was assured that the class would be suitable for beginners and so it was. Iyengar is a form of yoga that focuses mainly on holding poses and ensuring that the alignment of each pose is held accurately, from the weight placement of the palms right down to the angle of the feet, so that our bodies could benefit the most from each movement. Riana set her mat in the class facing the side wall, and not the mirror, puzzling the class. She explained that yoga was about “looking within yourself” to perform the right poses and she wanted us to concentrate on that without being distracted by constantly looking at our own reflections. A soft-spoken, feminine individual when one approaches her during a break, she emerges a different, sterner, almost military-like instructor once the class begins. She doesn’t hold back when she chides the students for slacking such as “Wider! Feet apart! Look up! Shoulders straight! Don’t look at the door! Why are you looking at the door? Concentrate on the class, concentrate on yourself!” And it worked really well. Who knew that so much technique went into simple poses such as the common Adho Mukha Svanasana (Downward-Facing Dog) or the Utkatasana (Chair Pose)? We were asked to always observe and be conscious of the way we held each pose. At times, Riana conducted the class with the help of belts and blocks to help students achieve the correct posture, such as during the Chair Pose when students had their arms strapped above their heads and were asked to lean against the wall to form the ideal half-seated position with backs straight. The classes were also interactive as she often gathered students around her to demonstrate a pose herself or with a student before allowing us to attempt them. With her keen eye for detail, she constantly went round the class attending to students, making sure everyone performed the poses in the correct manner, which I felt helped students to understand the techniques better. The highlight for me was probably the last part of the class when we attempted the head stand. Some of the more advanced students could already perform the headstand on their own but Riana pointed out some weaknesses in their pose that could potentially lead to injuries, such as the angling of the wrists, shoulders and neck. She stressed that more important than just being able to perform a pose was to learn the proper techniques and balancing to hold each pose safely and in a stable manner. All in all, the class was an eye-opener where one could learn and develop a strong foundation in yoga. The class is certainly ideal for all students, from beginners to the advanced practitioners who wish to fine-tune their techniques. wish there was a short video demo. Sounds like a great great class. It was a great class Will keep in mind the video demo suggestion. Is there a studio in KL that primarily teaches the Iyengar method? Thank you! There isn’t any yoga studio I know of that mainly specializes in Iyengar. However there are several studios that offer Alignment yoga classes, such as Beyoga in Damansara Perdana and Manasa Yoga in SS2, among others. 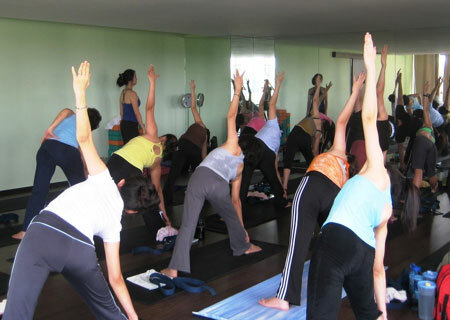 Swarupa Yoga @ Bangsar offers classes in the Iyengar Yoga method. All our classes are based on the Iyengar Yoga tradition. The studio is equiped with wall ropes and all the props thats required in an Iyengar Yoga class. The workshop that Jean noted is organised by Swarupa Yoga, Sri Nandakumar, a certified Iyengar Yoga teacher from Rishikesh will be teaching at the workshop. Please call me @ 012 3329388 or Parveen Nair @ 0122152149 for more details or drop by the studio at 58-2, Jalan Telawi, Bangsar, Kuala Lumpur. Hi Wayland, Sorry to have misquotedJean’s note. Just realised that she gave the link to Lance Schuler workshop. Jean,sorry for the mistake, my apologies. Swarupa Yoga is organising a series of workshops, Introduction to Iyengar Yoga, open to teachers all level of practioners. The 1st session on the 5th & 6th September, Standing Postures, 2nd workshop in early October on forward bends followed by Inversions in early November. Please call for more info. Hi Jean, we look forward to meeting you soon. The website for Swarupa Yoga is being finalised, should be up in a week. Will send you the link then. Daisy, perhaps alignment/iyengar yoga isn’t your cup of tea? After all, is yoga only about doing advance poses or staying in alignment constantly which is very difficult mind you. It could also be that your idea of yoga maybe different from the style the teacher is teaching. I suggest you explore other areas and try Parveen’s classes or other studio’s which offers alignment based yoga classes cos there are many different teachers and some might click with you better. Hi, is anyone interested in Iyengar Teacher Training Course, by Justin Herold (Certified Senior Iyengar Teacher), Venue: Aman Suria, PJ, Date: 26 March 2010 – 30 March 2010 (40 hours). For those who r interested to knw more abt Iyengar feel free to contact me. Namaste. Hi, is anyone interested in Iyengar Teacher Training Course, by Justin Herold (Certified Senior Iyengar Teacher), Venue: Aman Suria, PJ, @ “Yoga at Zea”, Date: 26 March 2010 – 30 March 2010 (40 hours). For those who r interested to knw more abt Iyengar feel free to contact me. Namaste. I will be in Malaysia from april to June 2011 and would like to do Iyengar yoga but not in KL – perhaps in Penang/Georgetown. Are there any centres around there. I am on a budget so cannot do those expensive yoga retreats.